In 2019, make your own must-see moments by entering the PGA TOUR Must See Moments Sweepstakes at PGATour.com/MustSeeSweeps. One lucky golf fan will win a trip for two to a PGA Tour destination of their choice including New York, Boston, San Diego, Hilton Head, Amelia Island, Orlando, and Austin. 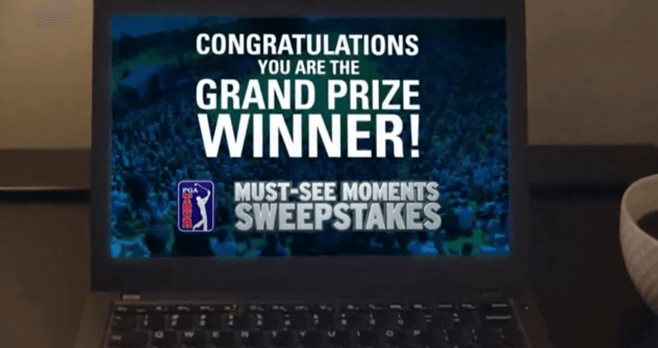 The PGA TOUR Must See Moments Sweepstakes is open only to legal residents of the fifty (50) United States and the District of Columbia and the US Territories/possessions, who are 18 years of age or older as of the date of entry. Begins on January 10, 2019 at 10:00 a.m. ET and ends on December 31, 2019 at 11:59 p.m. ET. Limit four (4) total Entries (one initial and three Bonuses) per person/email address during the Sweepstakes Period. For the names of the winners, available after January 31, 2020 and available for 30 days; visit www.pgatour.com/mustseesweeps. The Sponsor of the Sweepstakes is PGATOUR.COM, LLC, P.O. Box 3112, Ponte Vedra Beach, FL 32004. The Administrator of the Sweepstakes is Don Jagoda Associates, Inc. 100 Marcus Drive, Melville, NY 11747. For more information on the PGA TOUR Must See Moments Sweepstakes, including official rules, visit pgatour.com/mustseesweeps now!